With childhood obesity on the rise, concern over nutrition and exercise in the early years has never been greater. Elizabeth Walker investigates. The latest NHS figures reveal that over a fifth (22.4%) of reception pupils aged four to five are either obese or overweight and this has serious implications for their long-term health and development. a trend towards decreased levels of physical activity. Just like adults, children become overweight when they consume more calories than they use. A nutritious, balanced diet needs to be combined with sufficient physical activity in order for children to have a healthy start in life. give children the skills and confidence they need to continue an active lifestyle into childhood and beyond. In 2011, Government health experts issued guidance on exercise for children under five for the first time. Start Active, Stay Active is a report on physical activity from the four home countries’ Chief Medical Officers (CMO). It covers all age groups but builds on previous guidance by including specific advice for the early years. The guidance recommends that the under-fives should be physically active for at least three hours a day and they should not have extended periods of inactivity apart from when they are sleeping. Babies and young children are spending too much time watching television, travelling in cars and being strapped in their buggies. Instead, children who can walk on their own should be physically active for at least three hours a day. This should include a balance of light and more energetic activity spread throughout the day. Even babies and infants who are not yet walking should be encouraged to be active particularly through floor-based play and water-based activities in safe environments. reducing time spent in front of television. develop social skills and build emotional bonds. gymnastics and other sporting activities. Physical activity can therefore include unstructured active play as well as more structured activities such as sports and gym classes led by an adult. It is also important to minimise sedentary behaviour, as increasingly pre-school children are spending too much time watching television, using computers or tablets and playing video games. Children should be encouraged to walk, scoot or cycle short distances rather than being restrained in a car seat or buggy. Any young children who are currently overweight can improve their health by meeting the activity guidelines, even if their weight does not change. To achieve and maintain a healthy weight, they may need to do additional activity and make changes to their diet. Physical activity in the early years should always be fun. Parents and carers should try to be role models for active lifestyles and engage with young children in active play whenever possible. When families are active together, they get to spend more time together and build stronger emotional bonds as well as experiencing health benefits. In 2016, the Department of Health published a new infographic promoting physical activity in the under-fives based on the existing CMO guidelines. It aims to help early years practitioners, health visitors, and doctors to talk with parents about the importance of young children being active and can also be used as a training resource. The infographic is designed to explain the UK CMO recommendation that children aged under five should be physically active daily for at least 180 minutes, spread throughout the day. It also highlights the benefits of being active and the range of activity to achieve this recommendation. Local playgroups and other indoor play centres also offer opportunities for fun physical activities even when the weather is bad. 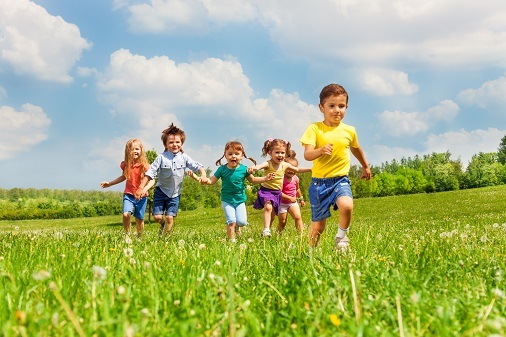 The Early Years Foundation Stage (EYFS), emphasises the importance of physical activity for children, and the need to encourage physically active play. The EYFS was revised in April 2017 and now specifically refers early years providers to the CMO guidance on physical activity. Childcare providers have a large part to play in enabling young children to fulfil the activity guidelines and they can support parents in developing healthy behaviours in their children from a young age. The EYFS requirements state that providers must offer opportunities for young children to be active and interactive and to develop their co-ordination, control, and movement. Children must also be helped to understand the importance of physical activity and to make healthy choices in relation to food. develop a healthy lifestyle and habits which they will be able to continue throughout life. specific staff training on physical activity in the early years. The critical importance of physical activity for overall development during the early years is evident and the CMO guidelines offer clear advice on how parents and other carers can give children a healthy start in life. Physical activity has very low risks for most under fives. However, childhood inactivity can have serious consequences in later life including the increased risk of obesity, heart disease, diabetes and stroke. Developing active behaviours in the early years can help the next generation to lead healthier and even happier lives. The following list provides useful information regarding physical activity in the early years. Start Active, Stay Active, Chief Medical Officers of England, Scotland, Wales, and Northern Ireland, July 2011. NHS Choices — Live Well (www.nhs.uk/livewell). Physical Activity Alliance (www.activityalliance.org) is a sector-led organisation comprising leading physical activity promoting organisations across the private and voluntary sectors. Early Years Alliance (www.eyalliance.org.uk) is an educational charity specialising in early years. National Day Nurseries Association (www.ndna.org.uk) is a national charity which aims to enhance the development and education of children in their early years. Work outs for the under-fives?